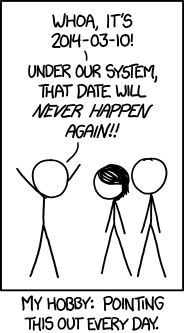 Today’s xkcd comic features a reference to the Long Now’s dating system in the “secret” mouseover text (hover over the image to read). Those that wish to be early adopters and start using 10k compliant dates now, please refer to our recent post on how to configure your computer’s date interface. For those that follow the comic, you may remember the reference to the far future in the xkcd comic “Time”. For those that don’t follow the comic: you’re welcome. This comic is licensed under a Creative Commons Attribution-NonCommercial 2.5 license, please refer to xkcd’s licensing guidelines if you wish to use this content.